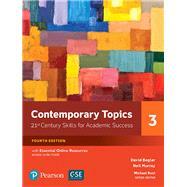 Now in a fourth edition, Contemporary Topics expands on its highly respected approach to developing academic listening and study skills. Organized around realistic college lectures, the text guides learners through carefully sequenced activities in skills such as note-taking, focusing attention, intensive listening, and vocabulary building. It also helps students evaluate their interests and explore possible career paths. New subject areas, presented as one-on-one academic lectures, emphasize professional applications such as software engineering, multimedia design, information technology, urban planning, and social psychology. Learning Outcomes listed at the outset of each unit let students know the goals of each unit and what their learning experience will be. New audio interviews with topic experts provide context for the upcoming unit lecture. Bottom-up listening and pronunciation exercises emphasize important principles and improve real-time perception. An oral presentation activity, supported by specific preparation and delivery strategies, concludes each unit and includes the opportunity for peer evaluation. Proficiency assessments composed of short academic audio lectures and multiple-choice exams simulate TOEFL-style test format for practice on high-stakes tests. New Essential Online Resources include audio, video, and teacher materials (assessments, teaching notes, answer keys, audioscripts, presentation points, and more). Corpus vocabulary drawn from the Academic Word List ensures that students are exposed to core academic vocabulary. Collaborative activities with presentation strategies and peer evaluations allow students to make connections and develop critical thinking skills. Unit comprehension tests assess students’ grasp of key concepts presented in the unit lecture. Mapped to the Global Scale of English.